The Single Father's Guide: Single Father's Book Club: A Friend for Dragon? No Friend of Mine. Single Father's Book Club: A Friend for Dragon? No Friend of Mine. When she was quite a bit younger, one of my daughters who had heard Dav Pilkey's`A Friend for DRAGON by her elementary school's librarian asked Santa for this book at Christmas. Santa delivered, but had mixed emotions once he read it. In summary, the hero is a blue dragon appropriately named, "Dragon." "Sometimes Dragon got lonely," so he set out to make a friend. Dragon asks a squirrel, a hippo, and a crocodile to be his friend, but each is "too busy," "too tired," or "too grouchy," respectively. When an apple falls on Dragon's head and a little green snake pretends to be the apple's friendly voice, Dragon finally finds a friend at last. Then, Dragon and the piece of fruit do everything together in spite of the fact that the apple really does not actually talk and is not really capable of any emotion, much less friendship. Eventually, Dragon becomes concerned that the apple will not talk. While waiting for the doctor to tell Dragon the reason the apple will not talk, a walrus eats the apple. Dragon is devastated and becomes even more forlorn as the apple turns brown, rots, and "dies." Eventually, Dragon buries the apple and mourns, but the next summer a tree sprouts from the place where Dragon buried the apple. Over time, the tree grows and produces hundreds of apples with whom Dragon can apparently befriend. A Caldecott Honor Book Award recipient (for The Paperboy,) Dav Pilkey illustrates A Friend for DRAGON in a very warm, colorful, and friendly way. The cute depictions of Dragon's exploits and emotions are quite endearing. Additionally, the text is easily understandable for the early reader target audience. However, while the story of Dragon's friendship with an apple is clearly a metaphor for perhaps a love of nature, a love of God, and/or a love for one's self, the more simple and literal translation is the protagonist's friendship for a piece of fruit. That's a little creepy. What is the message Pilkey is sending? "It's all right if you do not have any friends or lost a friend. Go to the kitchen and make friends with a cucumber?" If it's just a silly story - a children's book does not always have to have some great moral or deeper meaning, is the ignorance of the protagonist, Dragon, death the sort of subject for a fun, mad-capped, and harebrained romp? I don't get it. Still, there are some nice take-aways for a young reader from A Friend for DRAGON. For example, while there may be people in the world who are not willing to be a friend, a person, young or old, should not have anxiety about it. Rather, find something else to do and friendship will eventually happen. Also, like the snake who misled Dragon and the walrus who ate the apple without asking, there are people in the world who will deceive and who will be insensitive. In those instances, the repercussion of people's misdeeds may be out of our control and make a negative impact, but we should make the best of the circumstances. What else can we do? Finally, life goes on, and life does, in fact, have a way of repaying debts, whether the repayment is a detriment or whether the repayment is a benefit, like the harvest of an entire new apple tree for Dragon. 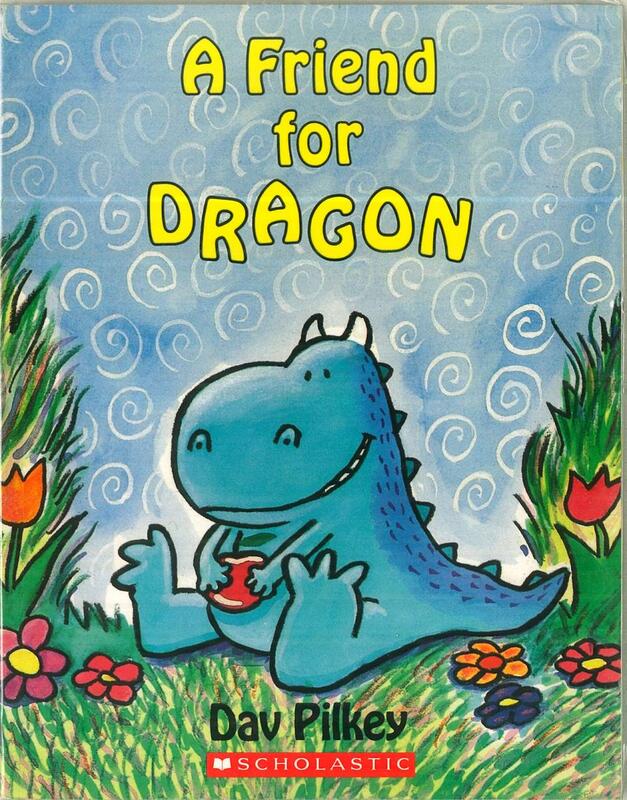 Overall, A Friend for DRAGON is not a book I would have chosen to buy for any child in my life. It's just a little odd from my adult perspective. The fact remains, however, that my daughter asked for this book after it was read to her during "Library" time at school. She likes it. A Friend for DRAGON is not offensive, rather it's just a little strange, but there are a few nice morals a young reader can take from it. Those morals, along with cute illustrations make this book okay to read and own, but, with other wonderful children's books available on the subject of loss and grief, A Friend for DRAGON is not a book I would recommend.